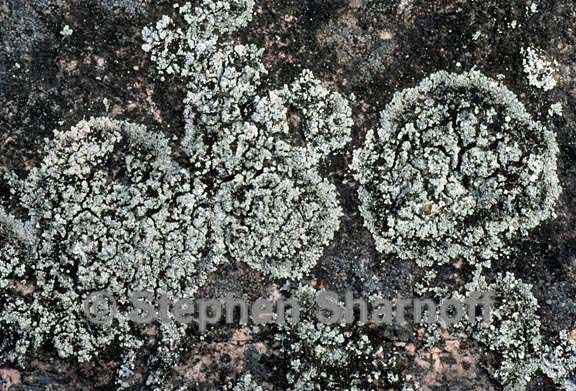 Thallus: crustose, usually not stratified and totally leprose, forming +regular rosettes or irregular patches, indeterminate to weakly determinate, up to a few cm in diam., well fastened to the substrate, not forming true lobes, but sometimes with obscure sublobes upper surface: whitish gray, often with a bluish tinge, rough, composed of soredia soredia: variably sized, coarse, usually compact, often pruinose, up to 0.2(-0.3) mm in diam., sometimes largest along thallus margin, usually without distinct projecting hyphae medulla: not evident lower surface: not evident Spot tests: thallus K+ yellow, C+ red, KC+ red, P+ sulfuric yellow Secondary metabolites: atranorin (usually a trace only). alectorialic and angardianic acids. Substrate and ecology: on rocks, including sandstone and basalt, and soil World distribution: Europe and North America Sonoran distribution: Arizona at 2135-2900 m.